Noah the octopus, Octopus Kids, and a Picture Wall. Noah was a little octopus for Halloween this year, and went walking through the neighborhood with a big group of friends. It was one of the cutest things to see him walking the sidewalks like a big kid in his costume. We borrowed it from my wonderful friend Jenny, whose 6 year old son, Augustine, wore it when he was 1. She said that he wasn’t walking yet when he wore it, so it was a whole new level of cuteness to see Noah walking around in it. 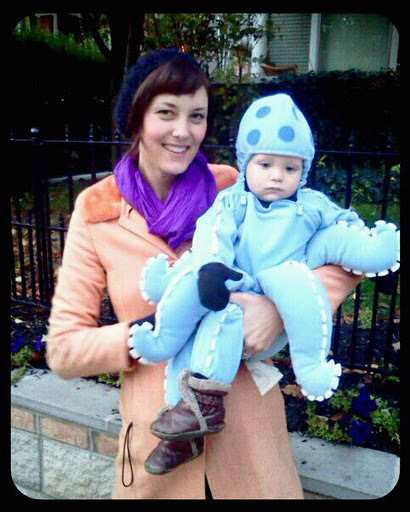 Also it’s a bit funny that I run a company called Octopus Caps and Noah was an octopus for Halloween. Speaking of Octopus Caps, I started Octopus Kids this week! 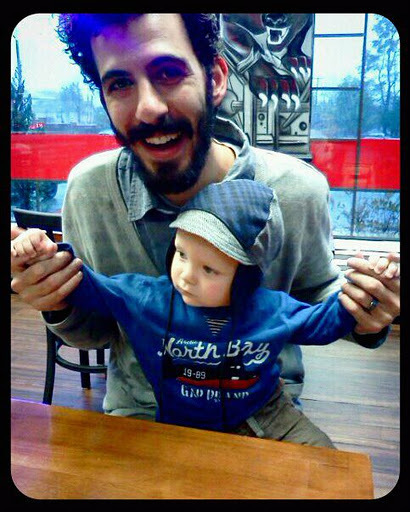 Noah has the first Octopus baby cap, and I thought it was so perfect that I needed to start selling them on Etsy. I think they will sell really well for the Christmas season. Noah was also wearing an Octopus Cap in my last post about apple picking. To get to Octopus Kids’ Etsy store, click here. Lastly, I got Noah’s gallery wall hung. We had friends from church over for a Halloween cookie decorating party, and I wanted to have it done for that, so I did it! I’m a big procrastinator, so having people over gave me a good jump start. Rudy pointed out that the “N” and clock on the bottom look like “NO”, something which escaped me completely! I think I’ll add an “AH” to the end of it and say I meant to spell “Noah” out. You have to be flexible with these things. Also I think I’m ready to pack up the Pack and Play, and put a bonifide toddler bed in Noah’s room asap! I like the idea of never putting a baby in a crib, but always letting them sleep on a mattress on the floor. Once they start crawling, they are free to explore their space. I’m never out of earshot of Noah while he’s sleeping, so I think this is a good thing for us, although it is nice to know that he can’t get into any trouble while inside of his cage, I mean crib. 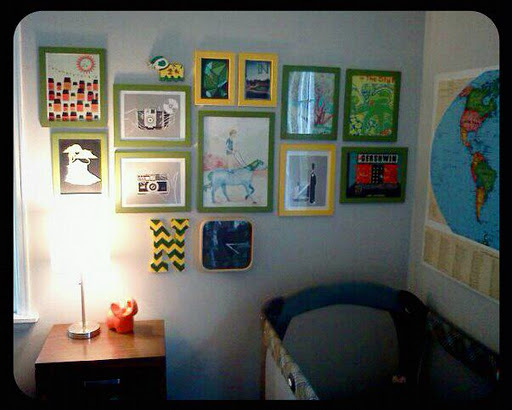 < Previous Picture wall in Noah’s room. Next > A Couple More Halloween Pictures!